Near the Dorset village of Studland, with uninterrupted views of the white chalk stacks of Old Harry Rocks rising from the sea, sits The Pig on the Beach. A Hotel from Robin Hutson, who previously captured peoples imaginations with the Hotel du vin Group, which he founded in 1994 and sold a decade later, but here has renovated a much loved former hotel, The Manor House. The Building itself is Grade II listed, dating from 1825 and was the seaside residence for a Tory MP and his 14 children. Now leased from the National Trust, the building has been restored to its former glory, with gargoyles, mullioned windows and Purbeck stone tiles. 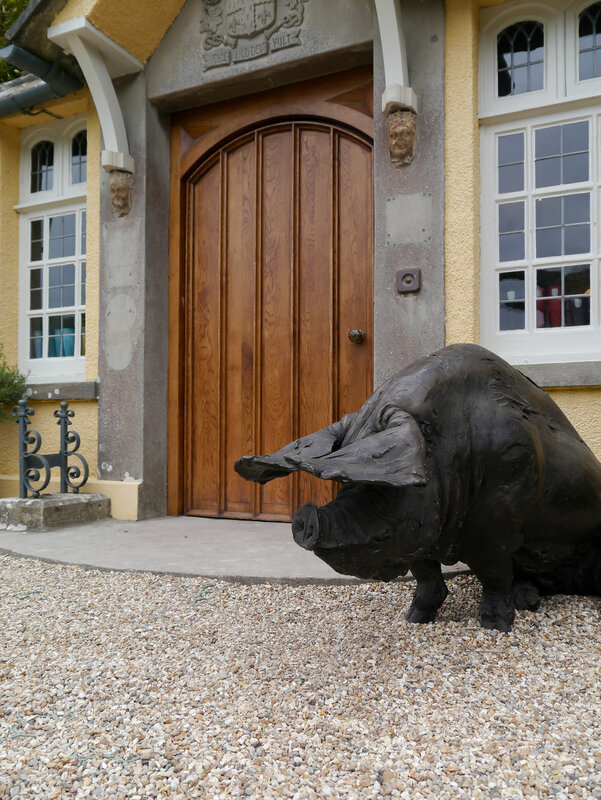 The Pig has created a signature style, that has become synonymous with their hotels. This is not the gloss of the Four Seasons or Mandarin Oriental, and has none of their formality, but is a more relaxed and charming hotel experience. The 23 rooms with sea-views and roll top baths are all generous. Decorated with white wash panelling, vintage tiles, sofas and a larder stocked with local treats and Nespreso machine. The Pig shuns the opulence of other hotels and delivers something more authentic and comforting, but always executed impeccably. This is a relaxed, modern take on the English country hotel, where the Victorian conservatory is a restaurant filled with herbs and edible flowers. The lounges are a mix of cosy and cool, all with dim lighting, open fireplaces, mismatched furniture and original features in the background. The restaurant is destination worthy, and often staying over night at the hotel is the only way to get a table, unless you are prepared to book well in advance. The food is uncomplicated, simple and localy sourced. The quality of the ingredients is paramount here, with all ingredients sourced from within 25 miles. In the walled kitchen garden across from the restaurant a team of gardeners prepare fresh ingredients for the restaurant. Doted throughout the grounds are sheep grazing on some of the lower terraced lawns, rare breed pigs busy themselves in pens behind the residents car park, chickens and quails rustle around just beyond laying eggs for the mornings breakfast. The food in truth is like the decor, relaxed but full of delight. The local charcuterie, mini scotch eggs and line caught fish are all prepared to the show the strengths of their ingredients. On the terrace, under vintage Liberty print parasols guests lounge enjoying their cocktails from the outside bar and enjoying pizzas fresh from the wood-fired oven. The breakfast though is worthy of special mention, and is to be eagerly looked forward to. There may be no bananas to add to your porridge, courtesy of the 25 mile menu, but the freshly laid eggs, home made granola, delicious bacon and pot of coffee more than make up for it. The real brilliance of the Pig hotels, is that they are in fact not sleepy English country house hotels at all. As a guest you can find many places to relax and enjoy the sea views or idle away by a warming fireplace, but all the while the hotel, the restaurant and the gardens are a hive of activity. On almost any Summer's evening you will find families playing French Cricket on one of the vast terraced lawns, couples drinking cocktails and locals wondering along the costal path in the distance. The Pig has people coming back again and again. As I was leaving a couple were already making a reservation as they checked out for next year, both intently scouring their diaries trying to figure out when they could come back, not many hotels inspire that kind of response. It really is that good.